Demonetizing has caused a little hustle in lives of people in India at present. Standing in long ques for hours in the scorching heat to exchange, withdraw and deposits money makes people tired and dehydrated. 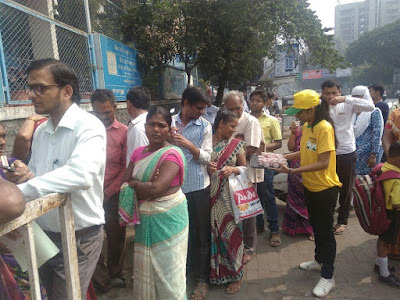 Wagh Bakri Tea Group, the third largest packaged tea company in India has taken an initiative by offering Tea & Ice Tea to the he people standing outside the BANKS & ATM'S that helps them feel refreshed and hydrated.